I love this page. I know there’s a million little panels, but this page just makes me laugh. Also: this appeared in print BEFORE the events of Chapter 5. The lucky few who picked up those first SuperFogeys books saw what was coming. Big thanks to artist Daniel Woodhouse! 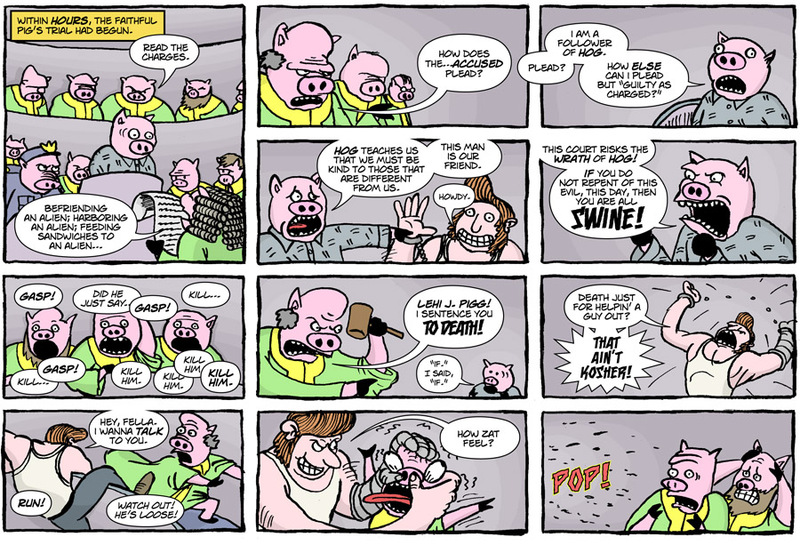 See you all next week for the end of Chapter 12 and the end of the Origin of Space Pig! Don’t forget to visit Brock’s new site over at brockheasley.com! LEHI?!?! I thought he would be named Parley Pigg Pratt! Or Orson Pigg-Hyde?